This is a summary for Brinley for ages 12.5 months to 13 months old. These are weeks 56-57. Eating is all good and continued on the same as it has been. She is still doing the sippy twice a day and bottle twice a day. Sleeping is all good and normal. We have a chance to try out one nap once a week now. One day a week we drive McKenna and some of her classmates to preschool. Pick-up time is during her normal nap, and we get home right at noon, so she eats lunch and then goes to bed. The one nap is not stellar–she is pretty tired by the time we get home and she only sleeps about two hours. I guess it will be a good indicator of if she is ready to drop the nap or not. The kids were all back in school and that meant…back to independent playtime! And guess what? She was awesome. It was like she never took a two week vacation. She even does it for an hour now–before she was 40-45 minutes. She just picked right up where we left off and I can tell she actually just loves it. Speaking of kids in school, the first few days were kind of sad. She would wander the house calling to her siblings. It was cute but they were no where to be found. She has quickly adjusted and she enjoys more one-on-one with me. She also gets lots of time with McKenna, and you can see in the picture above what happens when she spends lots of time with McKenna. 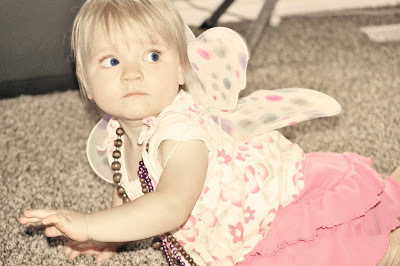 Dress up is one of McKenna’s favorite past times so she is sure to include Brinley in the fun. She is loving making animal sounds now. Brinley has taken FOREVER to get her next teeth in. During this time period, she was teething and cutting all four top teeth at once. She was not happy. Finally one popped through–but a lateral incisor instead of the central! I have never had this happen before. I did some researching on the good old Internet and from what I have found, it isn’t terribly uncommon and not a cause for concern. I don’t really see why it would be a problem so long as all of the teeth do come in. We have a dentist appointment next month so I will talk to him about it and get some information “from the horses mouth” so to speak. 8:45–bottle with solids (fruit, cereal, yogurt, finger foods). Independent Playtime happens in this block. Hey! I haven't heard you mention…Is Brinley walking yet? My Annalise started walking at about 11.5 months, but she just broke her leg(it's not bad, just a buckle in her bone)! She is so upset that she can't walk. She had it down so good. I'm worried she'll have to re-learn. During room time, do u close the door or is there a gate so she can see out? Stephanie no she isn't! She actually gets really mad if I try to get her to walk. My other two girls were late walkers. I am sure your girl will pick it back up very quickly! I wouldn't worry about it. Poor girl! J it is nice knowing your aren't the only one!